With just over two weeks to go before Deadpool hits theaters, 20th Century Fox‘s take on Marvel‘s Merc with a Mouth has been receiving promotion right and left. The latest video, a new Deadpool IMAX TV spot, has just come online and you can check it out in the player below! Ryan Reynolds stars as the title character alongside T.J. Miller as Weasel, Gina Carano as Angel Dust, Brianna Hildebrand as Negasonic Teenage Warhead, Morena Baccarin as Copycat and Ed Skrein as Ajax. The film will also feature the mutant Colossus, voiced by Serbian actor Stefan Kapicic. Reynolds has expressed a desire that Hugh Jackman might cameo as Wolverine, though it remains unconfirmed as to whether or not he will actually appear. Tim Miller is directing the movie from a script by Zombieland writers Rhett Reese and Paul Wernick. Confirmed to be rated R, Deadpool is scheduled for a release on February 12, 2016. Last year we had the opportunity to chat with Reynolds on the Vancouver set of the film. If you haven’t already had a chance, check out our Deadpool set visit report. We’ve also got spotlights on the Deadpool characters as well as behind-the-scenes looks at films featuring Ryan Reynolds and Gina Carano. 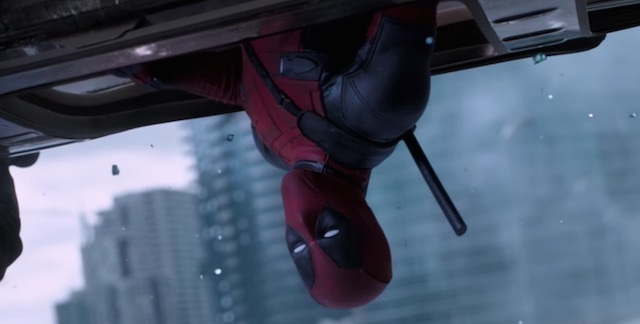 What do you think of this new Deadpool IMAX TV spot? Let us know in the comments below!